NO PURCHASE OR PAYMENT OF ANY KIND IS NECESSARY TO ENTER OR WIN AN INSTANT WIN PRIZE OR SWEEPSTAKE. A PURCHASE WILL NOT INCREASE YOUR CHANCES OF WINNING AN INSTANT WIN PRIZE OR SWEEPSTAKE PRIZE. BY PARTICIPATING, YOU ARE ACKNOWLEDGING THAT YOU HAVE READ AND UNDERSTOOD THESE OFFICIAL RULES AND AGREE TO BE BOUND BY THESE OFFICIAL RULES. THIS PROMOTION CONSISTS OF AN ONLINE INSTANT WIN GAME AND A SWEEPSTAKE. THE ONLINE INSTANT WIN GAME IS AVAILABLE IN AUSTRALIA ONLY. ELIGIBILITY: Open to legal residents of Australia and New Zealand who are thirteen (13) years of age or older. The following individuals are not eligible to enter or win a prize: employees, contractors, directors and officers of Zuru PTY LIMITED ("Sponsor"), its parent, subsidiaries and affiliated companies, franchisees, web design, advertising, fulfillment, legal, judging, advertising and promotion agencies involved in the administration, development, printing, fulfillment and execution of this Promotion (collectively, "Promotion Parties"), and the immediate family members (spouse, parent, child, sibling, grandparent, whether biological, adopted, "step" or in-law of each), and those living in their same households (those persons whether related or not who live in the same residence for at least three months during the twelve-month period preceding the start date of the Promotion). A valid email address is required to participate. Void where prohibited. PROMOTION PERIOD: Availability of specially marked packages containing Game Codes in-store begins from September 1, 2018, and ends on April 30, 2019, or sooner if Game Code supplies run out. The Online Instant Win Game and Sweepstakes entry begins at 12:00:01 a.m. Australian Eastern Standard Time ("AEST") on September 1, 2018 and ends at 11:59:59 p.m. AEST on April 30, 2019 (the "Promotion Period"), or earlier if Game Codes are exhausted. The website server is the official clock for this Promotion. 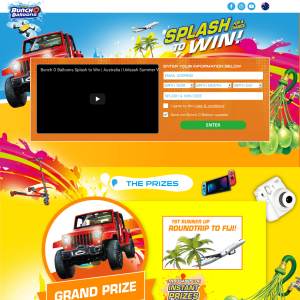 How to Play the Instant Win Game (Australia Only): Visit a participating Bunch O Balloons retailer (available on the www.bunchoballoons.com website) and purchase a specially marked product that says "Splash for a chance to Win". Once you have completed your purchase open the package and find the "wash and reveal" game piece on the balloon instruction insert. Remove the insert from the package and submerse in water to get it wet to reveal the game play code ("Game Code"). Then visit www.bunchoballoons.com (the "Website") and follow the on-screen instructions to enter your code during the Promotion Period for a chance to instantly win an Online Instant Win Prize ("Game Play"). Once a Game Code is used, it cannot be used again. Incomplete or indecipherable entries, and unrecognized Game Codes will be deemed invalid. Each Game Code entered online will result in one (1) sweepstakes entry. A limit of one (1) entry per Game Code applies. For the sake of clarity, New Zealand residents will only receive a sweepstakes entry for each Game Code and will not be eligible to win an Online Instant Win Prize. Bonus Entry: After successfully completing your registration you will have the opportunity to earn one (1) additional entry (a "Bonus Entry"; also an "entry") by sharing this sweepstakes via Facebook or via Twitter using the embedded buttons available on the Website. Limit one (1) Bonus Entry per person/email address. HOW TO REQUEST A GAME CODE WITHOUT MAKING A PURCHASE: To request a Game Code free please click here and follow the on-line instructions. Limit one (1) Game Code request per person per day. PRIZES AND RESTRICTIONS: Up to 1,000,000 Game Codes will be available for distribution, including via specially-marked packages and mail-in AMOE. Prizes are randomly time-seeded throughout the Promotion Period (each a "Winning Time"). The first Australian resident who completes a valid Game Play on or after one of the randomly generated Winning Times (as recorded by the Website software) will be deemed a potential instant winner of the corresponding prize, subject to verification of Game Play, eligibility, and compliance with these Official Rules. The odds of winning a prize are based upon the number of eligible Game Plays received, and the order in which they are received. The number of Online Instant Win Prizes available to be won in the Instant Win Game will decrease during the Promotion Period as prizes are awarded. Printing and other quality control errors will not invalidate an otherwise valid prize claim. Unless otherwise due to fraud or ineligibility under these Official Rules, all prize claims in excess of the advertised prize pool will be honoured. Instant Win Game materials will be void if stolen, forged, mutilated or tampered with in any way. Sweepstakes prizes for New Zealand. Sweepstakes Grand Prize (Australia and New Zealand). Sweepstakes First Prize (Australia only). Entry Period (November 2, 2018 to April 30, 2019) Drawing Date May 7, 2019 at at 1:00pm AEST at Anisimoff Legal, 5/210 Central Coast Hwy, Erina NSW 2250. Prizes are non-transferable and no cash redemption or prize substitution permitted, except at the sole discretion of the Sponsor. If any prize, or any portion thereof, cannot be awarded for any reason, the Sponsor reserves the right in its sole discretion to substitute the prize (or a portion thereof) in whole or in part with a prize of equal or greater value, subject to the directions of any regulatory authority. All costs and expenses associated with prize acceptance and use not specifically provided herein are the responsibility of the winner. RRPs are as of the date these Official Rules were finalized and may fluctuate. Any difference between the stated RRP and actual value at the time the prize is awarded will not be awarded. Any accessories, upgrades, and options not specified in the prize description are not included and are at the sole expense of the winner. To the fullest extent permitted by law, Sponsor does not make, nor in any manner is responsible or liable for, any warranty, representation or guarantee, express or implied, in fact or in law, relative to the prizes including but not limited to their quality, fitness for a particular purpose, or mechanical condition. All product and brand names are trademarks or registered trademarks of their respective companies, which are not sponsors of or affiliated with this Promotion or the Sponsor. One (1) Grand Prize: a Jeep Wrangler vehicle with automatic transmission with a recommended drive away price of up to: AUD$33,178.50 (inclusive of registration, compulsory third-party insurance, stamp duty and dealer delivery charges (which may vary by country or State by State in Australia). Grand Prize Winner must have a valid driver's license at the time of entry and must present a current valid driver's license prior to taking possession of vehicle; failure to present or show these may result in prize forfeiture. Grand Prize Winner is solely responsible for any additional insurance, options, petrol and all other ancillary costs associated with the continued maintenance of the automobile, including any travel or transportation costs associated with collecting the vehicle. All costs not expressly stated in these Official Rules as being awarded are the sole responsibility of the winner. Grand Prize Winner will be provided instruction to obtain his/her vehicle at a Jeep dealership to be determined by Sponsor. Grand Prize Winner must take delivery of vehicle at the location designated by Sponsor, within ninety (90) days of notification that dealership has received the vehicle. The vehicle will be awarded in "as-is" condition, subject to any warranty provided by Jeep Company. Vehicle will be delivered with standard equipment, as described above, and any accessories, upgrades, and options are not included and will only be added at the sole expense of the Grand Prize Winner. Sponsor does not make, nor in any manner is responsible or liable for, any warranty, representation or guarantee, express or implied, in fact or in law, relative to the prizes including but not limited to their quality, fitness for a particular purpose, or mechanical condition, to the fullest extent permitted by law. One (1) First Prize: a trip for one (1) verified winner ("Winner") and three (3) verified guests ("Guests") to Fiji for 5 days for 4 nights. Valued at up to AUD$6,635.70 depending on date and point of departure. First Prize includes: round-trip economy class air transportation for Winner and (3) Guests between a major commercial airport near Winner's residence to Fiji; 4 nights hotel accommodations (1 standard room; quadruple occupancy) and spending money in the amount AUD$500 and given in the form of bank transfer to Winner's account. First Prize winner is subject to verification (once verified, "First Prize Winner"). Actual value of First Prizes may vary depending on First Prize Winner's point of travel origin, airfare, and hotel fluctuations but will not exceed AUD$6,635.70. Any difference between the stated value and actual value will not be awarded. Airport, airline, and hotel accommodations will be determined by the Sponsor. Travel and accommodations are subject to availability and restrictions, including blackout dates. First Prize Winner and Guests must complete travel by December 2019. Booking must be made up to 30 days before travel. Exact travel dates are subject to availability and approval by Sponsor. No changes can be made to any trip element once it is booked/reserved. If Winner is unable to travel before December 2019, as determined by Sponsor, First Prize will be forfeited, and an alternate potential winner may be selected. First Prize Winner will be required to provide a credit card at time of hotel/lodging check-in to cover hotel/lodging incidentals. Guest must be eighteen (18) years of age or older at the time of verification. If First Prize Winner is eligible, but a minor in his/her state of residence, at least one Guest must be First Prize Winner's parent or legal guardian aged eighteen (18) years or older. First Prize Winner and Guest must travel on the same itinerary on the travel dates scheduled, comply with all security requirements for travel and are solely responsible for obtaining all necessary travel documents prior to departure date for travel (e.g., valid passport/visas). First Prize Winner and Guest are responsible for obtaining travel insurance (and all other forms of insurance) at their option and hereby acknowledge that Sponsor has not nor will obtain or provide travel insurance or any other form of insurance. First Prize Winner and Guest must sign and return a release of liability/publicity before travel is booked. Once Guest is selected, he/she may not be substituted. Travel arrangements are subject to availability and must be round trip. Flight itinerary may include one or more stops and/or layovers. All airfare, luggage fees, hotel, meals, ground transportation, gratuities, excursions fees, visas, passports, alcoholic beverages, and any other incidental costs or other expenses associated with the First Prize and not specifically set forth herein are the sole responsibility of First Prize Winner and Guest. Airline tickets are non-refundable/non-transferable and are not valid for upgrades and/or frequent flyer miles. Airline tickets are subject to flight variations, work stoppages, and schedule or route changes. Sponsor shall not be responsible for any cancellations, delays, diversions or substitution or any act or omission whatsoever by the air carriers, hotels, transportation companies, prize providers or any other persons providing any First Prize related services or accommodations. No refund or compensation will be made in the event of the cancellation or delay of any flight. Sponsor shall not be liable for any loss or damage to baggage. Additional First Prize details and travel information to be provided to the Winner at the time of notification. Lost, stolen, or damaged airline tickets will not be replaced or exchanged. All First Prize details are at Sponsor's sole discretion. Sponsor shall not be responsible for any damage to property (including hotel or travel accommodations arranged by the Sponsor) caused by the First Prize Winner and/or Guest's behavior. First Prize Winner and Guest participation in any or all activities on the First Prize trip is voluntary. Winners of an Online Instant Win Prize will be notified immediately in writing on screen and will be required to provide a mailing address in order to accept the prize. Failure to accept the prize and provide a mailing address prior to the closing of the Website (whether intentional or unintentional), will forfeit any claim to that Online Instant Win Prize. Online Instant Win Prizes will be shipped within 2 – 4 weeks of receipt of a winner's mailing address. DO NOT SHOW OR GIVE ANY INSTANT WIN PRIZE INFORMATION TO ANY RETAIL PERSONNEL. RETAIL PERSONNEL ARE NOT AUTHORIZED TO VERIFY OR REDEEM CLAIMS FOR THESE PRIZES. SWEEPSTAKES DRAWING AND WINNER NOTIFICATION: Sweepstakes winners will be selected in a random drawing from among all eligible entries received during the relevant Entry Period or the Promotional Period as set out above. Odds of winning depend on the number of eligible entries received. Drawing of the Grand Prize and First Prize Sweepstakes will be conducted on May 7, 2019 by a Sponsor representative, at 1:00pm AEST at Anisimoff Legal, 5/210 Central Coast Hwy, Erina NSW 2250 Australia whose decisions shall be final and binding on all matters relating to the Sweepstakes. Prize Winners will be notified in writing via email within two (2) business days of the draw and be required to fill out and return a prize claim form within ninety (90) days of the draw. WINNERS LIST: The names of winners of prizes valued at $250 or more, or any winners from ACT, will be published on www.bunchoballoons.com on May 10, 2019 The names of any winners from the unclaimed prize draw, if any, will be published on www.bunchoballoons.com on August 16, 2019. VERIFICATION: The Sponsor reserves the right, at any time, to verify the validity of entries and entrants (including an entrant's identity, age and place of residence) and reserves the right, in its sole discretion, to disqualify any individual who the Sponsor has reason to believe has breached any of these Official Rules, tampered with the entry process or engaged in any unlawful or other improper misconduct calculated to jeopardise fair and proper conduct of the promotion. Errors and omissions may be accepted at the Sponsor's discretion. Failure by the Sponsor to enforce any of its rights at any stage does not constitute a waiver of those rights. The Sponsor's legal rights to recover damages or other compensation from such an offender are reserved. TERMINATION: If the Sweepstakes or Instant Win Game is not capable of running as planned for any reason, including without limitation, due to infection by computer virus, bugs, tampering, unauthorized intervention, fraud, technical failures, or any other causes which corrupt or affect the administration, security, fairness, integrity, or proper conduct of the Sweepstakes or Instant Win Game, Sponsor reserves the right, at its sole discretion, disqualify any individual who is responsible or who tampers with the entry process, and to cancel, modify, or terminate the Sweepstakes or Instant Win Game, as appropriate, and subject to the directions of any regulatory authority. LIMITATIONS OF LIABILITY AND RELEASE: Nothing in these Official Rules limits, excludes or modifies or purports to limit, exclude or modify the statutory consumer guarantees as provided under the Competition and Consumer Act 2010 (Cth. ), as well as any other implied warranties under any similar consumer protection laws in the States and Territories of Australia or any statutory consumer guarantees as provided under consumer protection laws in New Zealand ("Non-Excludable Guarantees"). Except for any liability that cannot by law be excluded, including the Non-Excludable Guarantees, the Sponsor (including its respective officers, employees and agents) excludes all liability (including negligence), for any personal injury; or any loss or damage (including loss of opportunity); whether direct, indirect, special or consequential, arising in any way out of: (a) the Promotion; (b) any technical difficulties or equipment malfunction (whether or not under the Sponsor's control); (c) any theft, unauthorised access or third party interference; (d) any entry or prize claim that is late, lost, altered, damaged or misdirected (whether or not after their receipt by the Sponsor) due to any reason beyond the reasonable control of the Sponsor; (e) any variation in prize value to that stated in these Terms and Conditions; (f) any tax liability incurred by a winner or entrant; or (g) any prize. PUBLICITY: By accepting a prize, each winner grants permission for Sponsor and those acting under its authority to use his/her name, and address (city and state), photograph, voice and/or likeness, for advertising and/or publicity purposes, in any and all media (including posting on the Website) now known or hereinafter invented without territorial or time limitations and without further notice to and without additional compensation. GOVERNING LAW & JURISDICTION: This sweepstakes and instant win game is offered in the Australia and New Zealand and is governed by the laws of the Australia and New Zealand applicable thereto. SPONSOR: Zuru PTY LIMITED (ABN 19 614 731 547) Level 23, 525 Collins Street, Melbourne, VIC 3000, Australia.